C. F. Martin D-28 With Bigsby-Style Neck Model Flat Top Acoustic Guitar (1950), made in Nazareth, PA, natural lacquer finish, Brazilian rosewood back and sides, spruce top; curly maple neck with ebony fingerboard, chipboard case. Here's a really special and unusual Martin, and a great-sounding and looking guitar with a classic California Country Hot-Rod flavor. 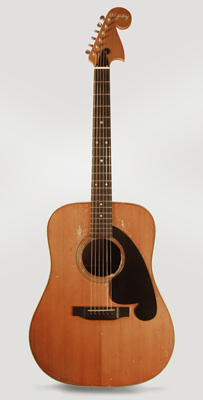 This 1950 D-28 is fitted with a replica Bigsby neck and pickguard, very similar to the instrument P. A. Bigsby personally customized for Merle Travis around 1949. The work is to an extremely high level and this is truly a unique piece. Overall length is 42 in. (106.7 cm. ), 15 5/8 in. (39.7 cm.) wide at lower bout, and 4 15/16 in. (12.5 cm.) in depth at side, taken at the end block. Scale length is 25 1/4 in. (641 mm.). Width of nut is 1 5/8 in. (41 mm.). There is a lot of wear to this old D-28 body, especially around the soundhole edge where some wood is actually worn away. There are small pieces of inlaid binding material missing around the soundhole as well. There is a one long repaired back crack and repaired cracks to the spruce on both edges of the lower bout. The newer Bigsby-style neck is subtly relic'ed with some wear to the edges. Overall a cool and excellent-playing guitar with a distinctive pedigree! Overall Very Good + Condition.